Short crust pastry is different from Puff Pastry in that it doesn't puff up when baked. It usually contains 50:100 fat to flour ratio. Traditionally it was made with animal fat lard or shortening, but you can use 50% butter or all butter or all vegetarian shortening. Lard, animal fat is considered best for making pastry but it is very rich in saturated fats! Vegetarian shortening is also hydrogenated fat which becomes solid when cold, just like clarified butter or ghee. This too it rich in saturated fats. You can make a sweet short crust pastry too. Follow the steps exactly, if you want a melt in the mouth yet crisp pastry. For people in India, a short crust pastry has a mathari or biscuit like texture. This pastry is NOT the small cakes slices that are called pastries in India. Makes 700 gm. or 1 lb. 8 oz. approximately of finished pastry weight. These days, most people buy it ready-made, specially since it keeps in a freezer very well. Pastry in India means small cup cakes or cake cake squares of various sort. But here in the west, it is a dough not dissimilar to 'mathari' or 'shakkar para dough', used to make various pies and rolls. Sieve flour and salt together in a large bowl. This gets rid of lumps and traps some air into the flour. Chop whichever fat you are using, into small cubes. Add to the flour and gently rub it into the flour first cutting it in with a knife and then rubbing with your fingers. More you lift and drop it with your fingers, more air it traps which makes a lighter pastry. It looks like bread crumbs when ready. Do not rub for too long. This stage can be done in a food processor, but do not overdo it, just until it looks like crumbs. Place in a bowl and make a little depression in the centre of the flour. Add half the water, mixing it with your fingers or a knife. Add more water slowly, kneading it very gently all the time, until you have a soft pastry dough. Amount of water cannot be specified exactly, us as needed is the best guide that can be given. The dough or pastry should be soft and smooth. It should come off the bowl cleanly and not stick to it. Do not over knead it. Wrap in a cling film and refrigerate for 30 minutes or longer. 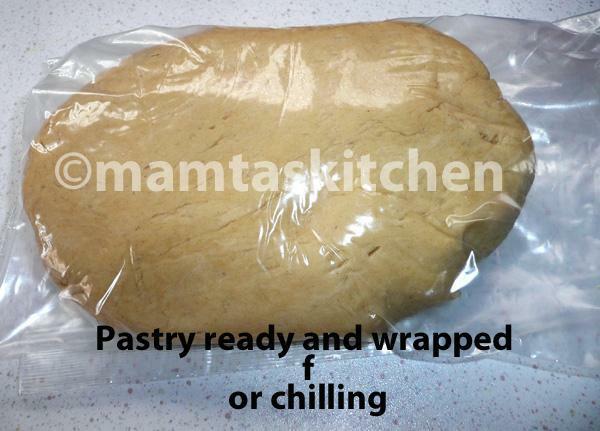 This pastry can be left in the fridge for a few days or frozen for using later. After this time, it is ready to roll out. You can make pastries of all sorts with it or simply roll it out and cut like biscuits and bake. I do this with the left over bits of pastry all the time and serve them with tea or hot soup. Roll it out on a floured surface, dusting with flour if required, to a shape you need for your pie dish. Sieve 75-100 gm. of icing sugar (very fine sugar) on top of flour and then rub butter (no animal fat) into flour and sugar mix, just like in savoury pastry-step3. Add 2 small, lightly beaten eggs and then a teaspoon or two of milk at a time, folding it in with your fingers, to make a smooth dough. Do not over knead. Wrap in a cling film and chill for a minimum of 30 minutes.